Just before we begin the next stage there is a reminder to make sure that you have plenty of food and water with you. Leave Carrión de los Condes by crossing the 16th century bridge and passing the 10th century Benedictine Monasterio de San Zoilo. This had originally been built as a convent but was used by the royal family of Castilla y Leon as their court. The building is now an impressive Parador, one of many state owned hotels most of which are in national historical monuments, or what we in the UK would call listed buildings. 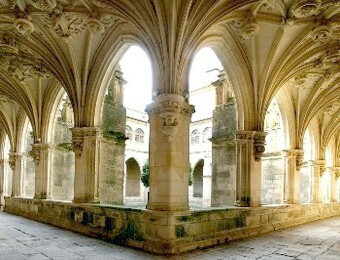 The building is beautiful in itself but worth seeing is the outstanding 16th century Renaissance cloister by Juan de Badajoz. From here the Camino de Santiago is pretty straight following an old Roman road known as the Via Aquitana, alternatively known as the Calzada de los Peregrinos. This ancient road provided a link between Burgos and Astorga. From the Monasterio de San Zoilo keep straight on crossing a couple of main roads and then onto a country road through farmland. After about 4 kilometres you come to the ruins of the Franciscan Abadia de Santa Maria de Venivivere. It is just after this point that you start to walk along the old Roman Road. The area around about is mostly flat but provides the pilgrim with endless views of the mountain range, la Cordillera Cantábrica, in the distance. After about 16 kilometres you come to the village of Calzadilla de la Cueza but you will have spotted the church tower a long time before you reach the village. The village is tiny, primarily just one street. There is a fountain as you enter and an albergue, a bar and a hostal that has a restaurant. It is worth filling up your water bottle and getting something to eat before you start up on your journey again. Head out of the village down the unusually named Calle Mayor, taking a right at the main road and following the gravel path to the left. Here there is a map giving you different routes if you were not planning to stay at Ledigos, but as Ledigos is our last stop on this stage we will ignore the map. 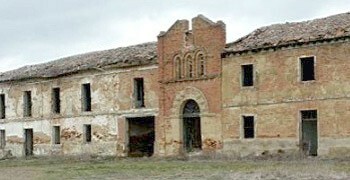 About 2 kilometres from Calzadilla de la Cueza you will pass the remains of the once hugely important 11th century pilgrim hospital of Santa Maria de las Tiendas. There is talk of restoring the building and turning it into a refugio, let’s hope this is true as it would be a great shame to lose such an important building. The old monastery also marks the half way point of the Spanish section of the Camino. Leaving the monastery we continue down the track before a slight upward climb and then a descent into Ledigos. The Albergue El Palomar is the only place to stay the night but it does have laundry and cooking facilities. Close by is bar if you fancy a drink and a small shop for provisions. The local parish church, la Iglesia de Santiago Apostol is the only church on the whole Camino which has Santiago in all three of his manifestations, the apostle, Santiago Matamoros (the moor slayer) and Santiago Peregrino (the pilgrim). Unfortunately, it is not easy to get in the church as more often than not it is locked.